Apple has dominated the smartwatch market ever since they released the Series 1. The Series 4 offers the biggest improvement over the previous generation with more features, a bigger screen, and a bigger price tag to match. Let’s find out if their sovereignty continues. Apple always makes an effort to give you an enjoyable unboxing experience and they don’t disappoint here. Included the box, you’ll get the watch itself which comes in a neat little pouch, your strap of choice, the magnetic charge cable, and the power brick. Generally speaking, the design is the same as its older brothers, but with a few minor changes. There’s still just a single button and the digital crown, but the crown now sports haptic feedback which is a welcome addition. The mic and speaker positions have been switched around and the speakers are much louder. The Series 4 watches now have ceramic back which enables radio waves to penetrate further for better overall connectivity. The display is where the biggest improvement has been made. The Series 4 has a 30% larger display and it is spectacular. If you’re upgrading from a Series 3 the difference is significant. The bezels are now much smaller and the screen goes almost to the edge of the body. I was a little concerned that this would make the watch feel bulky, but the slimmer body and smaller bezels mean it’s much more comfortable. The display isn’t the only thing that’s increased. The base price for the Series 3 starts at $279 and the Series 4 weighs in a whopping $399. On the plus side, there are so many variations to choose from. The first thing you want to decide on is if you need the cellular capabilities or not. For $100 more the cellular version will give your watch LTE capabilities along with a little red ring on your digital crown. Having a cellular option allows you to do a few things without needing your iPhone close to you. You’re able to make and receive calls, use Siri, navigation and use Apple Music. This use case is great for runners that might want to leave their iPhone at home and still be connected. In my case, I always have my phone on me and didn’t really need the cellular version, but choose according to your use case. Now it’s time to choose a color and finish. You’re simply down to either aluminum or stainless steel, the latter being the more expensive of the two. Then you need to decide on the strap. The silicone sports strap is easy to clean, quite durable and will probably be better if you perspire profusely. The velcro strap however, is so much more comfortable. This is not just because it’s softer, but you can get the exact size that’s comfortable for your wrist versus the holes on the silicone strap. There’s also a Milanese loop which is made from smooth stainless steel. This gives your watch quite a classy look and also fits quite seamlessly as it’s magnetized. Here’s a couple of tips so you don’t spend more than you need to. If you have an older Apple Watch, you can trade it in at the Apple store for up to $225. Apple will just take the watch itself and let you keep the magnetic charger and power brick, both of which can be used with your new Apple Watch Series 4. You can also find some really good quality generic Milanese loops on eBay. The Apple Watch has been around for some time allowing manufacturers to get as close to Apple’s design as possible. The generic one I picked up is indistinguishable from the original one. So if you’d like to save around $130, try eBay. If you really can’t decide you can book yourself an appointment at the Apple store and try out some of the variations. Apple has also added some new watch faces, some of which they actually recorded in a studio which is just ridiculously Apple. The flames face for example was recorded over a watch face that was engulfed in flames. Gratuitous yet undeniably cool. The featured one, however, is the new Infograph watch face. It is absolutely packed with complications. There’s a new gauge type of complication which can help display data in a gradient type of format. Some of the new complications are really useful, like a battery complication. Things like the UV index, less so. One major downside to the new Infograph watch face and complications is that developers need to update their complications from the ground up. Oddly, some native Apple apps haven’t updated their complications yet, which is a little frustrating for people who relied on them. You will need to stick to the older watch faces and older complications if you can’t live without them for now. The biggest drive from Apple for its new watch is aimed at health with some impressive features. The Apple watch will alert you if it detects unusually low or high heart rates which could be a sign of a serious condition, the symptoms of which aren’t recognizable by the average person. This could possibly lead to a condition being undiagnosed. If you’ve got a heart rate monitor attached to you at all times this could help you seek necessary medical attention. For all the fitness fans, the Series 4 is at the top of its game when it comes to helping you track your activity and workouts. The only thing not present in the Apple Watch is sleep tracking, which is admittedly a big deal for some people. The Series 4 hasn’t changed in that regard. You can, however, purchase a third party app which will allow you to track your sleep, but this should just be included by Apple. This is possibly the only area where the Fitbit is slightly ahead. Fitbit’s ecosystem allows you to track your food, workouts, and sleep all within a single app. Another minor issue: I found that while doing exercises like bench press, my hands would press the digital crown and Siri would activate. This is easily remedied by changing the orientation and having the crown on the other side. If you’re a boxing or MMA fan there’s no way your watch is going to fit under your handwraps or boxing gloves. Fortunately, Scosche makes a rock solid range of devices like the Rhythm 24 which is able to connect to your Apple Watch. This way you can take off your Apple Watch and still have your workout tracked through the heart rate sensor on the Scosche device. Probably the biggest addition when it comes to health is the introduction of the electrocardiogram or ECG. ECGs normally require about 12 electrodes being attached to you, and provides signals which are recorded by a special machine to be inspected by a medical doctor. ECGs can be used to investigate symptoms such as chest pains, palpitations and among other things can help detect things like arrhythmia. This is when your heart beats too slowly, too quickly, or irregularly. The problem with current ECGs is that you need to go into the hospital to get it done, and your heart may not behave how you’re expecting it to when you go to the hospital. Having an ECG capable device on your wrist might be able to solve this problem. In my speaking to some medical doctors, they assume that the data provided by a smartwatch will only supplement a diagnosis made by a doctor, meaning you will still need to take a traditional ECG at the hospital. A smartwatch won’t be a replacement for a finely tuned medical grade machine. The EKG feature won’t be available till later on in the year in the US and possibly even later in other countries. If this was your only use case you may want to hold off buying it for now. 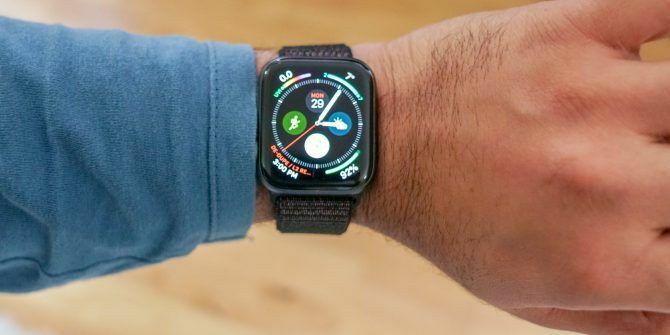 There are other features that make the Apple Watch series 4 a compelling buy for some people. The new accelerometer and gyroscope can detect if you’ve taken a fall. It will even call emergency services for you after 60 seconds and send an emergency message your contacts. So if you have a loved one above the age of 65, fall detection makes a lot of sense. Other things that may also come in handy for seniors will be the walkie-talkie feature which can at the touch of a button get you in touch without having to place a call. The walkie-talkie is available for any device running watchOS 5 or later. It’s like a push to talk feature but it is just a childhood dream to be able to speak into your watch like James Bond. There’s no doubting that the Series 4 overshadowed all the other Apple announcements this year and it’s easy to see why. If you’re fortunate enough to have other Apple devices the watch is a perfect addition to your walled garden. My only concerns, some of which are small, are the growing price, still no Android support, limited complication support and lack of sleep tracking. Other than that Notifications, audio control, and activity tracking are at your fingertips. Having tried many other smartwatches the Apple watch is still the best one money can buy. We’re giving away one Apple Watch Series 4, with your choice of color, size, and silicone or velcro strap. Enter below for your chance to win! Explore more about: Apple Watch, Fitness, MakeUseOf Giveaway, Smartwatch. I need the health option in the Apple Watch 4 with GPS and would love to win it.